The Staten Island Ferry carries commuters from Staten Island to Manhattan, but it also carries tourists who want to see the view of the city and the Statue of Liberty. The ferry is free and departs about every half hour, depending on the time of day. The trip between Staten Island and Manhattan takes about 25 minutes each way. Along the way, you’ll have nice views of the Statue of Liberty and the skylines of New Jersey, Staten Island, Brooklyn, and Lower Manhattan. Concessions on the ferry sell food and beverages, including beer. Scheduling and other information provided here is accurate to the best of our knowledge at time of publication. Please visit the ferry’s website to confirm details. The ferry runs around the clock most days of the year. Departures are about every 15 minutes during week day rush hours and every 30 minutes to an hour the rest of the time. Evening hours provide some great opportunities to view the illuminated Statue of Liberty and the lights of the Manhattan skyline. Bad weather and reduced visibility may cause schedule changes. On specific holidays (New Year’s Day, President’s Birthday, Memorial Day, Independence Day, Labor Day, Thanksgiving Day and Christmas Day) the ferry operates from 7:00 a.m. to 11:00 p.m. on a 30 minute schedule. 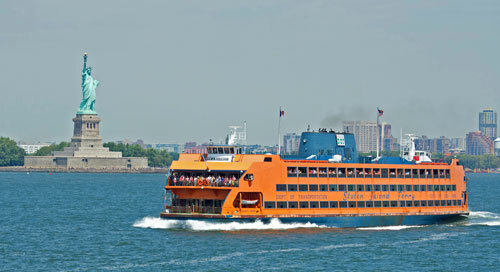 See the official Staten Island Ferry schedule. The Whitehall Terminal is located at 4 South Street in Lower Manhattan, near Battery Park. Many people just ride the ferry for the view and then turn around and ride right back. If you can spare the time, though, there are some interesting things to see in Staten Island. Note: To make the round trip, you’ll need to disembark on one side and enter back trough the terminal building for the return trip. The St. George Esplanade provides great views of Manhattan and is where you’ll find Staten Island’s 9/11 Memorial. The Staten Island Museum is a great place for families to visit, and WPA murals in the Borough Hall provide an interesting look at Staten Island history. During the summertime, you can attend a Staten Island Yankees minor league baseball game. The ball park is within easy walking distance of the ferry terminal. See list of things to do in Staten Island for details.